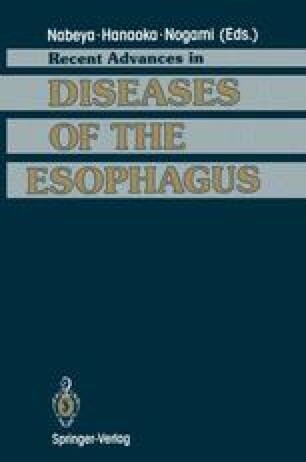 Congenital esophageal atresia is seen in 1 out of 3000 living births today. The cause of this malformation is a disturbance of the separation of the esophagus, trachea, and lung during their embryonic development. The resulting abnormalities have many different forms but can classified into five major groups as described by Gross-Vogt  (Fig. 1). During pregnancy, a hydramnion can frequently be noted, and the postpartum clinical consequences can include choking or coughing. Already during the first hours, the regurgitated gastric juices can pass into the lungs and cause chemical pneumonia and atelectasis. Therefore, an early diagnosis and proper treatment are of vital importance.